Thank you so much for pointing out that site – its wonderful! Oh youre not alone. I think about my old-lady self CONSTANTLY. Hoover DAM, that is an awesome site! Ye gods! Youre not alone. I see older women who look great and I have to refrain from asking how old they are – I just need to know its possible to be that old and still have some sense of style. I was just looking at Advanced Style a few minutes ago and thinking that its one of the things that makes me seriously grateful for the internet. And yes, not only do I constantly think about how Ill dress when Im 80, Ive also already bought some clothes for the occasion. I figure Ill be dressing wildly Inappropriate for an 80 year old woman and constantly breaking my hip because i refuse to give up high heels! Totally awesome! I shall definitely be wearing purple when I am an old. Perfect timing! Thanks so much for the link to Advanced Style. Lately Ive been wondering if I should subdue my retro look at the age of 62. Now I would never even consider it! Ive decided Im going to be a Cranky Old Lady when the time comes. You know, the kind thats always waving her cane at people and hollering at those whippersnappers to get off her lawn. And Ive got a while to go since Im turning 30 this year, but Im already getting in practice by mumbling to myself while I rummage through my coupons and paying for things entirely in change. I love you for letting me know about this blog. Ive felt like a LOL (lil old lady) inside from the very beginning. I was thrilled to find Advanced Style and even more thrilled when one of my found photos was posted on the blog. Its a photo of a woman and her dog from the late 60s. Shes wearing an outrageous paisley top. Her German Shepherd has a pink bow to match it. Her glasses are amazing. See?http://tinyurl.com/leuq77I gleefully await being of advanced age and doing it with style! Cant wait to hit the geezer set because I know thats when Ill finally hit my fashion stride. What a great site. When I get old I am going to dress like Mrs. Roper. I will probably wear purple when I am old, but that is because I wear purple now! Why change my style?Ill probably wear pink as well, and whatever outlandish colors/patterns I currently wear.Thanks for the links. There are some great photos there. I plan to be even more weird when I get older, but I worry about not being able to sew my own things. I doubt RTW will meet standard when I have been able to sew my own all these years. Ill just have to keep sewing as much as possible so as not to lose the skill! Yes, I always wonder about what to wear when I get older. And heres a question that has been plaguing me for years, and Ive yet to find an answer:Why do old ladies wear short trousers? I recently asked my sister … how will i know when its time to start shopping at the (apparently secret) grandma store for my clothes. I so enjoyed both of your links – thank you! Oh, Im looking forward to checking this website out!Why WOULDNT a woman over 60 have style? Shes had more time to practice putting herself together than someone 30 and under!I like to keep in mind the advice given in The Mirror of Graces: The most beautiful woman is not at fortywhat she was at twenty, nor at sixty what she was at forty. Each age has an appropriate style…;and it is the business of discernment and taste to discover and to maintain those advantages intheir due season.Barbara, I dont think you need to worry. Youll still be Barbara at 40, 50, 60, 70, and on. Unless you anticipate all your clothing preferences changing at once, or someone sneaking into your closet on the eve of a birthday and stealing all your clothes, what you wear neednt change solely on the basis of your age.I do think there need to be some concessions on the grounds of good taste and common sense as we get older: it just is seldom flattering for a 60-year-old to dress in the extreme of fashions designed for a 20-year-old … but it isnt always flattering for a 20-year-old, either, to dress in those extremes. Ill still wear silver leather, if I want to wear silver leather – but its more likely to be a jacket, or a long skirt, or boots, or a vest, rather than silver leather pants, or a silver miniskirt.One of the few strictures I do lean towards is that, as we age, whatever ones style, ones grooming should be as impeccable as possible. Disheveled works better on, say, a woman in her 20s, rather than a woman in her 60s. It doesnt look cute, or gamine, on a 60-year-old; instead, it tends to make her look as if she has been in an accident, or forgotten her medication. Its fine to be a woman in her 60s, living alone except for a herd of cats; however, you dont want to look as if you should be pushing a shopping cart down the street piled with all your worldly goods AND the cats. I sincerely believe in this grooming stricture … and, some day, hope to abide by it. Still working on that, though.Heh. I have every intention of wearing red, and purple, when I get older – but then, Ive been wearing them for YEARS. (Instead of a winter coat, I had a purple cape. In high school. In the 70s.) Im not exactly happy that theres a fad for the colours Ive loved; Im hoping that the vogue for them will pass. Im a long-time hat wearer, and Im especially annoyed that wearing a red hat now seems to designate me as a member of a cult. On the other hand, it does make finding red hats easier these days.Since I often lean a bit towards the more formal in what I wear, I actually intend to take every possible advantage as I get older of dressing UP as much as I want to. I always wear a hat; Im going to start looking for gloves that will work with my outfits.One of the most fabulous women I saw recently was in her 60s; I dont remember what she was wearing, but I DO remember her haircut: short, chic, and silver, with FABULOUS purple and lavender streaks in it. As far as Im concerned, getting older means MORE freedom to dress as myself, not less. If I want to wear lime-green boots to work, whos to stop me?Something not often talked about: dressing to please oneself is often EASIER for women as we get older, because theres less need to worry about unwanted male attention and comments. The type of oaf who makes comments isnt going to make them when he sees grey or silver hair, or other signifiers of age. He wont make them, because he doesnt actually see women who are middle-aged or older. Take advantage of that Cloak of Invisibility! I want to be this lady:http://advancedstyle.blogspot.com/search?q=mintThat dress! The hair! The glasses and satisfied smile! And I would KILL to have that figure and Im half your age.And I agree that Stars-n-Stripes Guy has the best lapel pin EVER. I dont know what could be cooler than a MAN wearing flowers. Belphebe, I was thinking less about comments regarding ones taste (which would seem to fall in the Rude Comments: Female category), to which one may always be subject (someone, sooner or later, is bound to hate your taste in lipstick colours – those kinds of comments cropped up even in the Advanced Style blog), and more about the kinds of comments that, for lack of a better description, fall into the Assault/Mating Call Comments: Male category (Hey, bay-BEE, Hey, bay-BEE! )The second are the types of comments I expect to diminish/disappear as women get older.And I agree with you whole-heartedly about the red hat cult. I struggle with trying to be happy that it apparently affords some women a feeling of solidarity and a group with which they feel comfortable, one that encourages them to embrace growing older … and a distaste for the cultlike aspects and the assumption engendered when I choose to wear a red hat that Im a member of that group. No, I am not. If Im going to join a group, Id prefer it to be based on more than the mere fact of my growing older. Ill be dead eventually, too – doesnt mean I want to join a group just because its members will also die eventually! Tip: You can style white hair the same way you would Platinum Blonde. For those of us with darker hair…it will be a Divine Revelation/Big Break! 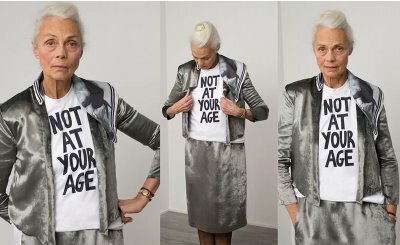 This is advertising the label Old Ladies Rebellion oldladiesrebellion.comThey have been featured in the Guardian loads recently. My biggest concern now (and Im barely 34) is not dressing as a mutton in sheeps clothing. I date the 24 year olds, I dont want to look like them.I dont worry about my 80 year old self partly because I have no intention of being alive at 80, and partly because I plan on having a bout with dressing inappropriate when I AM in my 40s (low cut mostly, but I do that now anyway). I figure I plan my mid-life crisis now, Ill be forgiven for anything I do later.As to dressing my age, Im the only one I know that does. Out of the 5 of us that hang out, Im the only one that doesnt borrow their kids clothes, dress/talk/act like their kids, and generally dont try to live my teenaged years over again.I have more fun that way. I am 44. I am hoping to be considered elegant when I am old. At this point I am planning on leaving the gray in my hair and just having a good stylish cut. I would like to look good in anything I choose to wear, but I think that will depend on if I can be committed to an exercise program. There is an excellent book that is written for women in their 40s and above that teaches women how dress stylishly and what looks good and what doesnt on the older woman. Its called How Not to Look Old. Ive learned a lot from this book. I make cracks all the time about what I will wear when Im old. I may have have a cane, for instance, but you can be damn sure itll be covered in leopard print!And what if I need a hearing aide? Nothing says it has to be that blah flesh color. I would add little sparkles, or glitter glue.Thank god we live in an era where we can do what we want, and have the confidence to do so. We dont have to run out and get the dreaded helmut-head haircut at 50 (Im 52 and still wear my hair long and wavy). We dont have to wear old-lady dresses (I was just looking at a picture of my mother at my college graduation — she was the age I am now — and Im stunned at how different we look).We can be strong, beautiful, powerful, stylish women at any age, and Im not just saying that as some kind of phony positive thinking bs. I really believe it. They can take my Chuck Taylor All-Stars from me when my body is cold. Not a moment before. Of course, these days I wear my Chucks with orthopedic insoles. But thats our secret, right? Ive been rehearsing for old ladyness since I was 15–a LOOOOONG time ago. Ruth Gordon was my no. 1 role model. My very first time here at Dressaday which I have been peeking at daily for a long time. Decided to jump in! Since Ive always wanted to be more comfortable than stylish getting older has been more of a challenge fashion wise. Taking youth for granted is over LOL. Now Im more conscious of not looking too ragged or thrown together. I see so many fabulous styles / patterns at my site that I can at least pick and choose something that is timeless and ageless. In my desperately late 50s! Okay Im a goof – think I have it figured out now! Instead of Sheila Who? I am Sheila at Out of the Ashes Collectibles at http://www.risingfeenix.com – lets try this again – smile! Good heavens. Is that the Mary Wales Loomis who, I think, had a book out on How To Make Your Own Shoes? If it is indeed she, I bought that book back in the Jurassic …. its quite useful. Must go see! I have always planned on living till 109. Not 108 or 110. Pacing myself. Ive been thinking about how Im going to dress when Im old ever since my dad said to me last summer, When are you going to stop dressing like a mod? Youre going to be a funny-looking old lady! Whats wrong with that?